Sometimes what cats want isn’t good for them. Car accidents are probably the highest cause of juvenile mortality. Read what happens at Do cats really have nine lives? Cat fights cause nasty infections including the cat AIDS syndrome. Friendly cats often get taken by other people- read one example here. Cats being dieted are good at finding other food sources. Neighbours often complain about cat faeces, noise or fighting. Wildlife should not be hunted by our cats. Cats who hunt can get serious parasitic diseases. 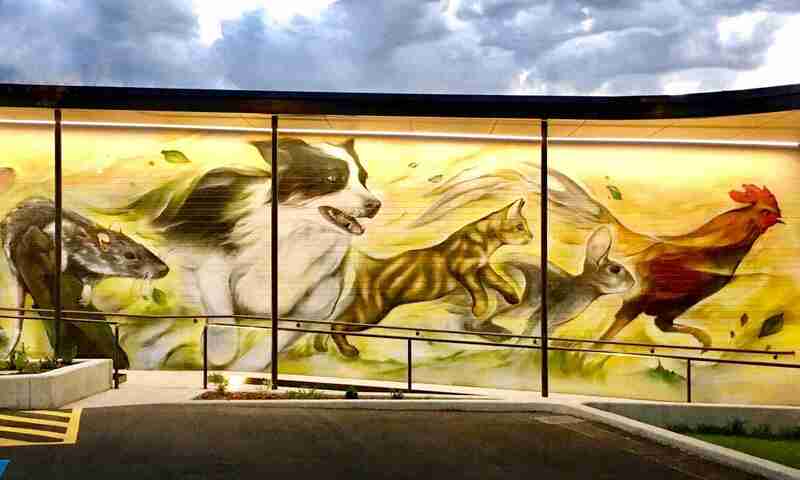 Australians have a long tradition of letting cats outside, but it’s changing fast. More and more cat owners are making the decision to keep cats inside. Start young. The more a cat gets used to being outside the harder it will be for them to accept not being allowed to. Consider enclosing a part of your yard or patio. It’s really hard to stop cats escaping with a single barrier like a door. There are many companies who can do it for you. Keep cats amused- the subject of this article. You’ve made the decision to keep your cat from roaming. How do you stop them getting bored? Here are the ideas you gave us, plus a few of our own. It’s all about variety. A veterinary behaviourist who keeps cats once said she won a free house makeover by an interior designer. The poor man had a nervous breakdown. It’s a sad fact that you can’t have a modern minimalist house and a cat-friendly house at the same time. Cats love clutter and complexity. Cats are visual like us and don’t like big exposed areas; think of how they love the storeroom or cupboards, or shrubby gardens. This is a great way to get multiple cats to get along; make it so they can sit without being in direct view of the other cats. Simple ideas include vases to separate a mantelpiece in two, indoor plants or IKEA-style shelves and cubicles. Many people take it one step further and set aside a hideaway; they know where they go but don’t disturb them when there. Some cats just like a bit of private time, others are stressed by small children or visitors. These places should be really, really cluttered! Your cat may have already claimed your store room; if so, go with it. Cats want to live fully in three dimensions but we often don’t allow for it. You are only limited by your creativity. Here’s what Andrew did in his kitchen; with the exception of the $79 IKEA shelves shown earlier it all came from stuff he already had in the shed. 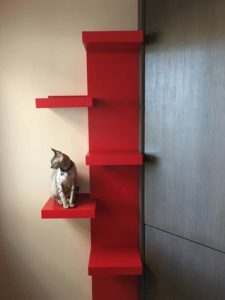 Visit this page for a step-by-step guide to how to turn IKEA shelves into a cat ladder. Cat cafes in Japan are also worth checking out on YouTube. 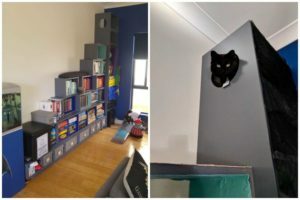 These are places where people go to watch cats hanging out and they are full of great ways to use furniture and vertical space. Cats love being able to look out, especially from a high place. Giving them places to sit next to windows is easy. 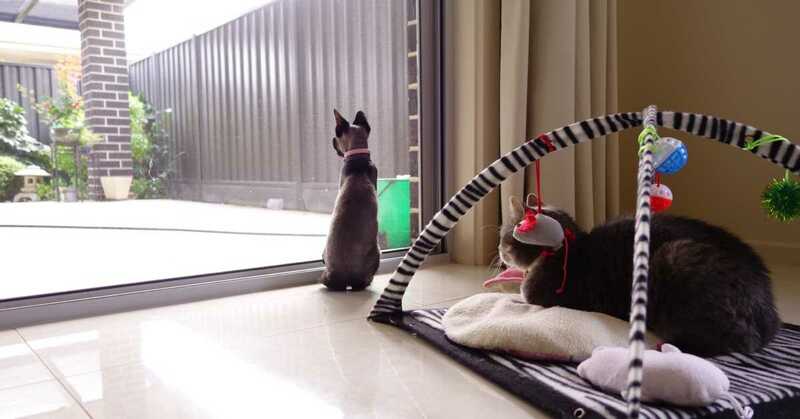 Just make sure that other cats aren’t able to stress them by looking in from outside. If you can’t make an outdoors enclosure, you can make an enclosed shelf that connects with an open window so a cat can look at the world outside. Cats love new things. Don’t throw away those cardboard boxes or shopping bags. Leave them out for a few days for something new to explore first. 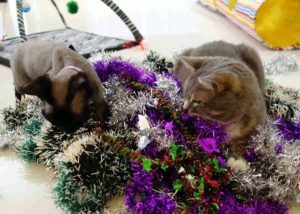 You can even get creative like Krystle & Adam have done here for their cats. Boxes can be joined up to create whole tunnels, or you can buy fabric tunnels pre-made online. These clients turned book storage into cat heaven. Even a fish tank! Most shop-bought scratching poles are too small, unstable and don’t allow cats to stretch out as they scratch. This puts your lovely furniture in the firing line. Get a BIG scratching pole that doesn’t rock or wobble. Even better, combine the pole with a whole cat gym so cats can climb and play. Have a look at the palatial creations at O’s Poles for example. If scratching furniture is still a problem, read our guide to clipping cats’ claws. We’ve already written about cat grass. It isn’t just a fun texture to nibble: we think it’s a part of a normal cat’s diet. It also may help cats to avoid nibbling toxic flowers like lilies. Some cats love cat nip, others couldn’t care less about it. It’s worth bringing a bit home to see if your kitty will like some in a pot. Have you noticed how cats love water and hate water at the same time? Read about the major issues cats have with drinking water so you get this right. Water can be so much more than a drink. Offering a cat fountain makes the water interesting as well. Many cats love to get in the shower after it’s been used & make muddy footprints everywhere. Indoor aquariums can give hours of fascination. Believe it or not, people have actually MADE videos especially for indoor cats. Just search ‘videos for cats’ in YouTube and experiment with different ones until you find some that interest your cat. We know of at least one group of cats that get hours of amusement from these. There are also iPad and tablet apps (search ‘games for cats’) where cats can tap at moving images. 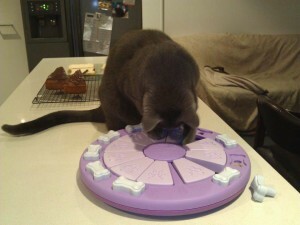 Toys are the sort of thing that depend very much on the taste of the cat. Here’s the Undercover Mouse toy, easily available on eBay. The most important thing is variety. Cats often invent their own toys from things they find in the house. Remember that string is very dangerous to cats and should not be left out. Why feed food in bowls? Much of a wild cat’s day is spent catching or attempting to catch their food. 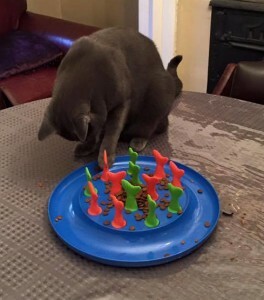 Many smart people have made great ways to get cats to work or think a little for their food. Obviously, make sure your cat can do it by making changes in slow steps and making sure the food is being eaten by the right cat. What about Hansel and Gretel-style trails of biscuits around the house so your cat has fun tracking them down (as long as you pick up any left behind afterwards). Two must-visit sites for creative house cat ideas are Hauspanther and Food Puzzles For Cats. You can easily make a food dispenser from any spherical or cylindrical plastic container (eg soft drink bottles) by cutting holes of the right size in it so food falls out when it rolls around. Here it very much depends on the cat. Andrew’s cat was socialised with a dog from a young age and now loves to rumble with Loki at least 30 minutes a day. it’s probably his main form of exercise. Older cats may not be able to cope with a dog without anxiety. Most cats prefer the company of another cat if they don’t have to compete for space, food or attention. However it very much depends on their personalities. 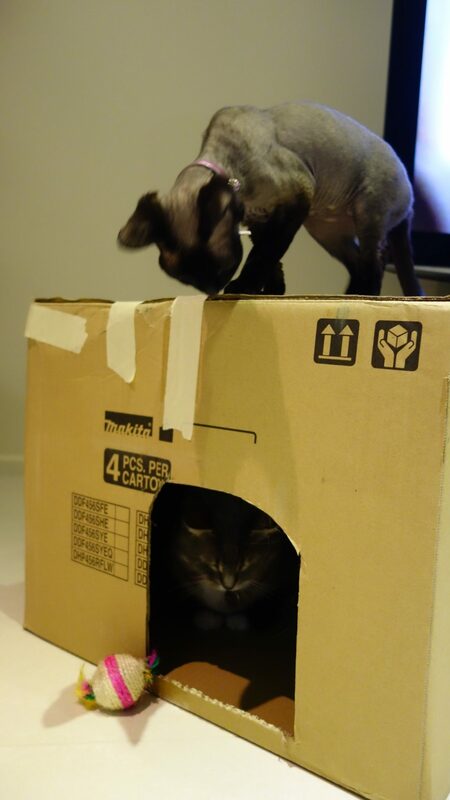 Usually a cat-friendly house can accomodate two cats without any conflict. Of course cats would love to watch prey species all day but we’re not sure that’s humane for captive rodents or birds. Plus it only takes one loose wire and it’s all over. Fish do seem OK with cats, and a birdfeeder near a window is probably OK.
There’s nothing like one-on-one time to make your cat happy. Buy a cat leash & harness set and take your cat out for strolls or just allow time for your lap to be available and motionless. It’s good for us to stop every now and then too. Many cat owners regret accidentally teaching their cat to attack hands. It usually starts with fun games, sometimes with a toy in your hand, but as cats age and get stronger they often also get a lot rougher. It’s far better to use toys that create separation, such as fetch games, fishing poles etc. Place edible plants near windows and you’ll see how much cats enjoy them. Sometimes too much. Here’s Grendel with his cat grass, which needs a sturdier pot so he doesn’t keep knocking it over. Many people take their cats out in the yard or park on a long leash and harness made especially for cats. Whether it’s enjoyable all depends on the cat. What Else Do Indoor Cats Need? A common mistake is to assume that infectious diseases and parasites won’t affect indoor cats. FIV prevention should not be necessary unless another cat in the house is infected or goes outside. However, cats still get exposed to the viruses in the F3 vaccination, and still need protection from fleas and worms. Vaccinations and yearly checkups are just as important. When vets see cats who haven’t been to the vet for a few years, there is almost always at least one thing wrong that the owners aren’t aware of. Desexing is also essential; undesexed cats of both sexes go a little crazy if cooped up. On-heat cats and entire male tomcats also attract a chorus of stray cats to your windows- stressful for you and your cats. Another mistake is to not have a microchip because they live inside. The error is discovered when a door is left open and they get out. Cats not accustomed to the wide world often get lost very easily. For the same reason, it’s still good to have a labelled collar. Obesity is a big issue, mainly because food is left out and your cat is close by. It’s probably worsened by cats who don’t have much else to entertain them. In our guide to feeding cats we recommend starting kittens on timed, measured meals to get them used to you being in control of portion size. If cats learn to expect that their bowl is always full, it’s very hard to change later. 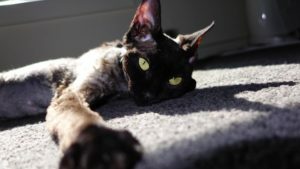 Having a cat accustomed to being fed on demand also creates an unhealthy relationship where cats harass owners for food, and may use food as a form of attention-seeking behaviour. Litter trays are a necessary evil. We don’t advise you enclose the litter tray even though that makes it a lot friendlier on the eye and nose. Once enclosed, ammonia gas levels get very high and damage the respiratory tract. Also, it’s easy to forget to change the litter if you can’t see it’s dirty. There’s a guide to toilet training on our cat care page. All of our cat owning clients who shared their ideas.